Abstract : Natural mountains and valleys are gradually eroded by rainfall and river flows. Physically-based modeling of this complex phenomenon is a major concern in producing realistic synthesized terrains. However, despite some recent improvements, existing algorithms are still computationally expensive, leading to a time-consuming process fairly impractical for terrain designers and 3D artists. 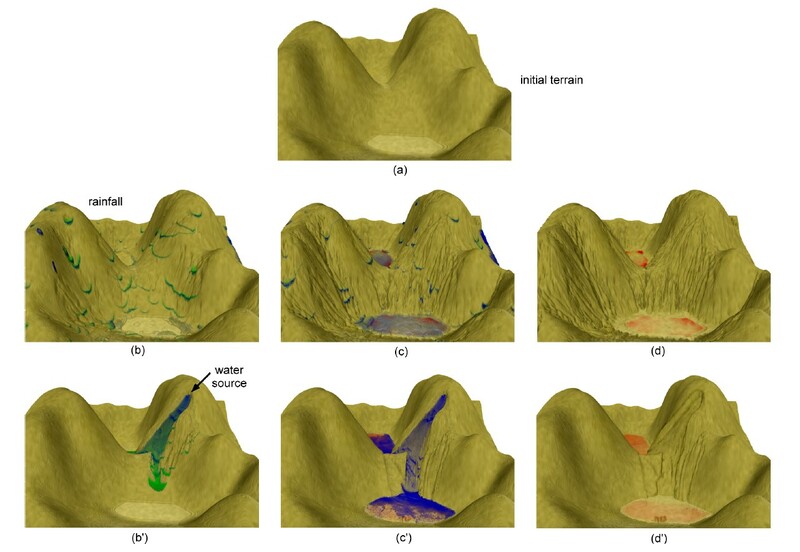 In this paper, we present a new method to model the hydraulic erosion phenomenon which runs at interactive rates on today's computers. The method is based on the velocity field of the running water, which is created with an efficient shallow-water fluid model. The velocity field is used to calculate the erosion and deposition process, and the sediment transportation process. The method has been carefully designed to be implemented totally on GPU, and thus takes full advantage of the parallelism of current graphics hardware. Results from experiments demonstrate that our method is effective and efficient. It can create realistic erosion effects by rainfall and river flows, and produce fast simulation results for terrains with large sizes.